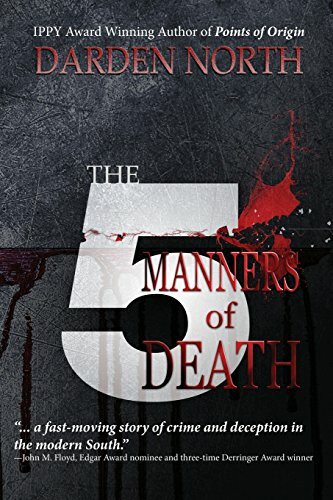 “The 5 Manners of Death” by Darden North is a thriller that follows Dr. Diana Bratton, a surgeon who, after finding a note by her beloved aunt detailing the five manners of death, becomes the center of a series of deaths herself. The small Southern town that serves as the setting for much of the novel is home to a vast cast of characters, all of whom have something to hide. The atmosphere that North builds is charming. There’s something infinitely eerier about a disturbing mystery that takes place in such a quaint town. It is the strongest element of the novel and the one that I most enjoyed. Another interesting piece of “The 5 Manners of Death” is the medical knowledge woven into the story. As an accomplished surgeon, Dr. Bratton has a set of skills that prove invaluable to her during the investigations. It’s explained thoroughly, in a way that the reader finds easy to follow and engaging. I did have a few issues with the story, the first being an imbalance of dialogue and prose throughout the work. The dialogue is wordy and takes up most of the book, which throws off the pace of the plot. There are sections of exposition that flow nicely by themselves, but are often thrust in the middle of big patches of dialogue, bringing the story to an abrupt halt. In the first fifty pages, at least four characters are killed off, just paragraphs after being introduced. I found this stop-start style of writing made it impossible to establish a visible pace. The mystery itself is handled well, up until the end. After a series of unexpected twists, the antagonist explains his ‘master plan’ to the protagonists in the final few pages. Presenting little motivation for this sudden turn, it serves only to tie up the plot’s remaining loose ends, which I felt weakened everything that was built up to that point. Character motivation presented a consistent problem throughout the novel in my opinion as well. In one scene, Dr. Bratton had the perfect opportunity to turn another antagonist over to the police. After spending much of the book planning to do just that, she chose not to, undermining every action she had taken to reach that goal. Overall “The 5 Manners of Death” has its highs and lows. The mystery is strong, as is the atmosphere. A professional edit could easily take care of some of the issues noted. The highest point of the novel was definitely its Southern setting.